Chelsea and Arsenal have been fined £40,000 and £30,000 by the Football Association after failing to control their players during a fiery derby at Stamford Bridge on 19 September. Both teams were involved in a fracas before half-time when Arsenal's Gabriel was sent off for allegedly kicking out at Chelsea striker Diego Costa. Gabriel had his red card overturned with Costa banned for three games. The London rivals have also been warned about their future conduct. In a tempestuous match that Chelsea won 2-0, Arsenal midfielder Santi Cazorla was also sent off after 79 minutes for a foul on Chelsea's Cesc Fabregas. But it was the first-half incident, and the subsequent repercussions, that drew most attention. Costa, 26, received his ban for violent conduct after appearing to put his hand in Arsenal defender Laurent Koscielny's face, an incident which referee Mike Dean missed. And once Brazilian defender Gabriel became involved, he and Costa received a yellow card each before the pair continued a running verbal battle on their way back to the half-way line. 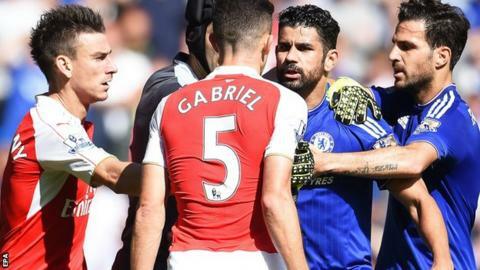 It was then that Gabriel kicked out at Costa, and was sent off by Dean, but the FA subsequently rescinded the red card after an Arsenal appeal and chose to punish Costa for the earlier incident. Gabriel still received a one-match ban and a £10,000 fine for failing to leave the pitch immediately.